The Slovenian team Ceeref, with Rod Davis at the helm for this regatta, wins the Sea Dubai RC 44 Gold Cup match race ahead of the fantastic Spaniards on board Islas Canarias Puerto Calero. Ceeref also conquers the season title ahead of a disappointed Dean Barker, on board Artemis, ninth of the event. 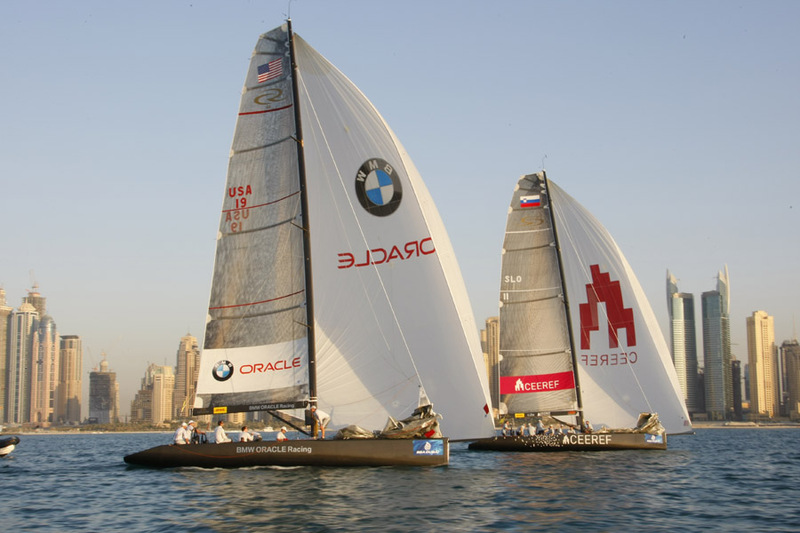 November 26, 2009 – The Sea Dubai match race took place today in a light and fairly stable sea breeze. Due to the cancellation of the races yesterday and in order to save time, the fleet got split into two groups of five boats, resulting in two parallel rankings. The wind unfortunately didn’t allow for a Grand Finale; the event is nevertheless valid, with five flights completed and a proper ranking. Sailing for the season title, Artemis, with Dean Barker at the helm, suffered from a steering failure during the pre-start of the first regatta against Team Sea Dubai. Markus Wieser, who was steering the local team, immediately saw the benefit he could get from this situation and inflicted a penalty to his opponent before the start, winning the race and an important point although Barker and his team remained a serious threat until the arrival line. However, Dean’s steering position, squatting in the cockpit during the entire race - holding the spare tiller - made a come back impossible. The RC 44 technical team managed to repair the failure but the crew on board Artemis suffered throughout the day, sailing way below their usual level and finishing a disappointing ninth overall. A result that allows Ceeref to grab the annual Championship Tour match race title. The irony of the story is that Artemis’ main opponent today was no other than their own coach: Rod Davis, steering Ceeref exceptionally today as a substitute to their usual helmsman Sébastien Col, who was not available this week. Davis was on fire, beating Team Aqua in the first flight after a fantastic match race lesson that included a dial up at the windward mark, fake jibes and many more of the “dirty tricks" available in the match race encyclopaedia. 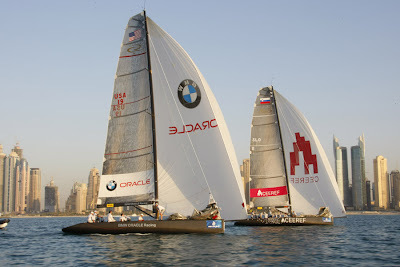 Ceeref then went on to beat Team Austria, Organika and BMW ORACLE Racing, finishing the contest unbeaten. The situation was tighter in the second group, with Islas Canarias Puerto Calero (José Maria Ponce) winning ahead of No Way Back (Ray Davies) to grab the second place overall. There were many penalties today, and the overall ranking is deeply affected by the nervousness of some of the teams. Indeed, Team Aqua – who was third overall in the match race ranking before this regatta – finishes the Gold Cup at an unbelievable last place and ends up seventh in the yearly ranking. Artemis, who was leading, finishes fourth… On the other hand, Ceeref is the season winner ahead of No Way Back and Karol Jablonski’s Organika, definitely on great form after their performance last week in Nice. The fleet regatta starts tomorrow. Artemis leads the season ranking, two points ahead of Team Aqua and five points ahead of BMW ORACLE Racing and No Way Back. Artemis dominated last month’s event in Portoroz and is the favourite of this contest. However, as the match race event proved, nothing’s ever acquired until the last race! 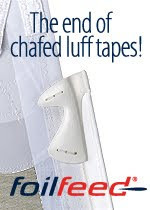 Rod Davis, helmsman, CEEREF: "CEEREF is a very easy team to fit in. It is a slick and very well run operation. All I had to do is take the helm and concentrate on my steering: the manoeuvres were perfect and Michele Ivaldi was giving me great strategic advice. I had a big pressure because I am usually sitting on the coach boat: if I loose, people will say "who are you to give advice…" I focused on remaining calm and trying to identify the issues and find the right answers." Jose Maria Ponce, helmsman, Islas Canarias Puerto Calero: “We knew in the morning that it would be a very difficult day, with a light breeze. Our first race against Paul Cayard went really well; we managed to give him a penalty before the start and won nicely. It gave the entire team a great boost of confidence and we carried on sailing very well. The mental is very important in those races, and when you start well it gives you a huge motivation." Dean Barker, helmsman, Artemis: “I am extremely disappointed. We had this steering failure during the first race and it affected our entire day. We just didn’t get back into it, and sailed very average. It is frustrating that we are loosing the title due to a gear failure." Ray Davies, helmsman, No Way Back: “I am very happy with our day, especially the second part of it as we finished very strong. We should also have won the first race against the Spaniards but we were called back at the start and didn’t manage to get back. There was obviously a strong pressure today because it is the end of the season and the points become very important. We salvaged a good day."